ESCAPE TO THE SOUTH WEST AND EXPERIENCE THE DREAMIEST SEASCAPES, RURAL BOLTHOLES AND SUNSET VIEWS, OFFERING A SHORT BUT SWEET RETREAT. FROM THE EXPOSED DEVONSHIRE MOORLAND TO THE TRANQUILITY OF PRETTY COVES AT THE RAME PENINSULA, DRAMATIC CLIFFS OF THE JURASSIC COAST TO THE EXPANSE OF SAND AND SCULPTURAL ROCKS OF A SURFERS PARADISE IN NORTH CORNWALL, SINK INTO STUNNING SPAS, HILL-TOP VISTAS, HIDDEN BAYS AND AN EXUBERANCE OF STYLE THAT WILL LINGER LONG AFTER YOU LEAVE. SOAK UP DREAMY INTERIORS AND LASHINGS OF COMFORT SET AGAINST A BACKDROP OF SEA AND SKY. DISCOVER A PLETHORA OF AWARD-WINNING EATERIES BOASTING LOCALLY SOURCED, FRESH PRODUCE AND EXPERIENCE A TRUE TASTE OF THE SOUTH WEST IN AN AREA OF OUTSTANDING NATURAL BEAUTY. OPH - you won't want to leave! Step into the stylised yet homely surrounds of Old Park Hall, kick off your shoes and relax! Originally built in the Georgian era as Newenham Abbey’s deer lodge, it was later transformed by Dame Emma Tullock, into the Scottish Baronial Manor that you see today. Situated on the Devon/Dorset border, with the Jurassic coast right on the doorstep, Old Park Hall boasts breath-taking views across remarkable countryside. In the middle of foodie heaven, both Trill Farm ‘The Old Dairy Kitchen’ and River Cottage HQ are just two and a half miles down the road. Lyme Regis and Bridport are a few minutes’ drive away and home to fabulous industrial-rustic props and interiors outlets such as Old Albion and the antiques market. West Bay the home of the popular television series Broadchurch is also situated nearby. Enjoy Climbing to the highest point on the South Coast – The Golden Cap – for a truly stunning setting. 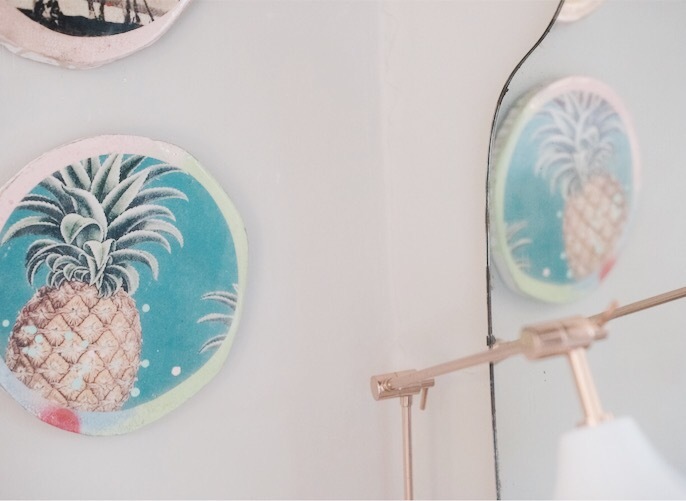 Be prepared to leave Old Park Hall wanting to re-design your home; the house has been exquisitely transformed with bold interiors, bright colours, contrasting textures and the unexpected. The vibe is very much industrial-lux mixed with modern furnishings and a touch of vintage. Every corner has been carefully thought out in terms of styling and colour palettes with objects working in harmony to compliment each other. Think comfort with all the mod cons and an interior that takes you from summer to winter with ease; a home from home retreat that is grand yet far from stuffy. Fresh, seasonal and local is the ethos behind the food and drink, taking inspiration from the wide variety of quality produce in the area. Daisy cooks up dishes based on good honest, home cooking that was very much instilled by her Grandfather, who is still found helping out in the kitchen, making his delicious soups. There is not a menu as such but a dish of the day; generally fish, due to the proximity to the sea, served with the freshest seasonal vegetables. The plates are beautifully presented, with attention to detail and flavours to savour. Unusual touches include the help-yourself & weigh it deli comprising of local cheeses, ham, cured meets and tomatoes, with homemade soups and cream teas rustled up on request. An honesty bar can also be found in the dining room, honing in on the local gins. Prepare for the ultimate restorative escape; Seavista provides the dreamiest of coastal retreats, boasting stunning cliff walks and sweeping bays within a surfer’s paradise. Soak up the beauty of the north Cornish coast and enjoy a slower pace amidst laidback, stylish interiors. 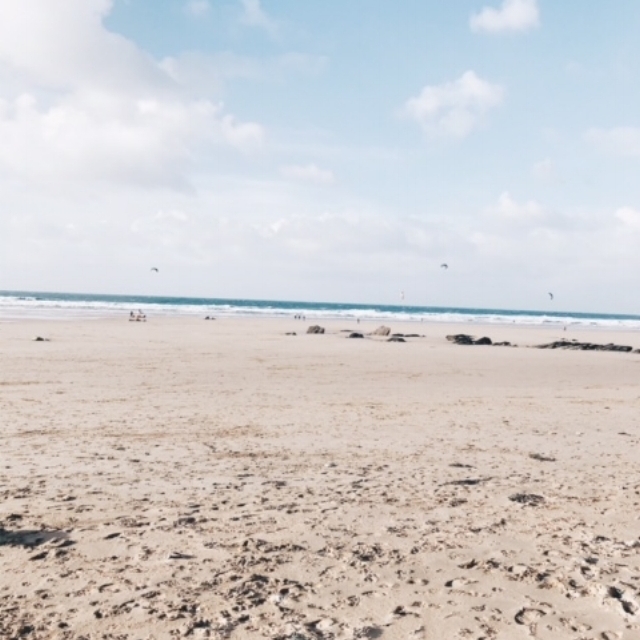 Centrally located in North Cornwall, overlooking Mawgan Porth beach, Seavista offers the idea location to explore all of Cornwall. The area boasts some spectacular cliff walks right on the doorstep, fantastic local cuisine including Jamie Oliver’s ‘Fifteen’, just around the headland, along with some of the most stunning beaches including Watergate Bay, Bedruthan Steps and Mawgan Porth beach, all with their huge expanse of sand at low tide and dramatic sculptural rocks. Seavista provides the ideal space to kick back and relax; décor is contemporary chic with mid-century modern and quirky interiors. Palettes are predominately white with some statement walls and furnishings in blues and greens, reminiscent of the sea. Standout furnishings are sourced from Graham & Green, Loaf and Made.com, along with vintage finds from Ebay and fabrics from independent interior designer, Lydia Aniktou, bringing all of Kate’s ideas into something cohesive. The space is very much influenced by the coastal surrounds, delivering a light and bright environment where views are celebrated and fun and quirky pieces take centre stage, amidst a clean minimalist backdrop. Breakfast is designed to be the best meal of your day, created with thought and care and enjoyed in the light-filled dining room styled with vintage floral wallpaper, quirky flamingo lamps, brightly coloured place mats and retro printed crockery. Kate is fastidious in sourcing local and ethical foods of the highest quality, with a passion for cooking and the creative process of presenting intricate plates, adding ingredients discovered on her travels. The menu at Seavista is extensive; enjoy a fully laid-up breakfast bar of granolas, mueslis and berries before tucking into a diverse range of cooked options ranging from classics such as a full English, smoked salmon and scrambled eggs and poached eggs with avocado to the transatlantic French toast with bacon and maple syrup, stacked pancakes and super-food porridge. Escape to a 17th century Georgian bolthole and enjoy a fusion of mid-century modern and ‘country-house’ chic surrounds; Westcroft offers a stylish retreat in a characterful home, surrounded by carefully curated art and stunning views in an area of outstanding beauty. The ideal bolthole to retreat to, Kingsand is also ideally positioned to explore various coastal towns in Cornwall such as Polperro, Fowey, St. Ives, Cape Cornwall, Padstow and Rock. From March to October a passenger ferry leaves Plymouth’s historic Barbican and cruises across the Plymouth Sound, landing just half an hour later on the local beach, where you can walk down a gangplank onto the sand and embrace an era bygone. Built in 1760 and renowned as a smugglers bolthole, the house still has two way cupboards as well as a smugglers’ tunnel as an escape route in the cellar that passes under the road outside to the sea. Much of this character is reflected in the Grade II listed guesthouse today where many of its original Georgian features such as paint finishes and original uncovered woodwork are retained. 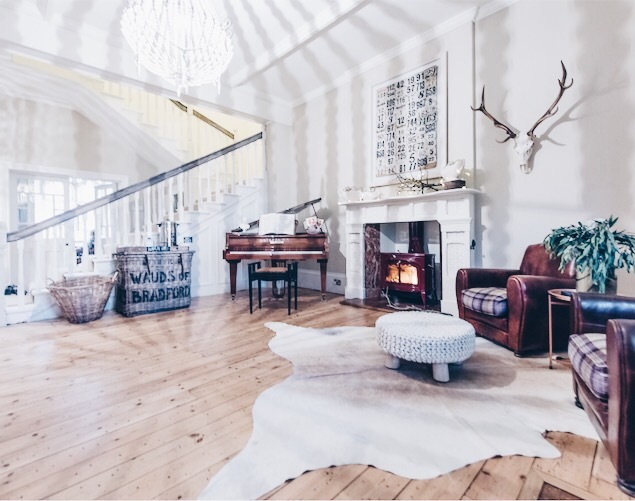 The style of the house is a deliberate fusion between Georgian, mid-century modern and ‘country-house’ chic, with each space being carefully curated to provide a different mood and feel depending upon the room. Cornish contemporary art adorns the walls, the majority of which are from Westcroft’s very own gallery. Breakfast at Westcroft is a treat that will set you up for the day. Attention to detail lies within all that is placed on the table – organic, locally sourced and individually tailored; an experience to be enjoyed at leisure, layer upon layer of freshly baked breads and croissants, fresh fruit, local eggs, cured bacon and homemade juice blends. The Rame Peninsula has become a recognised destination for outstanding food, boasting eateries such as The View restaurant and the Carew Arms both featured in the Michelin Guide. Also the Devonport Inn, just steps away, cooks fabulous local seafood and locally sourced meat. Soak up the surrounds in this beautifully renovated period dwelling where flagstone floors and lavish furnishings provide a backdrop to relax in one of Cornwall’s most sought after fishing ports; a coastal retreat, drenched in history with lashings of style. Coswarth House is situated just 150 yards from the charming Padstow Harbour and a five-minute ferry ride across the Camel Estuary from Rock. Both Padstow and Rock are renowned for their watersports including surfing, water skiing, kitesurfing, windsurfing, wakeboarding and sailing as well as being a real hub for foodies, home to some fantastic eateries from chefs including Rick Stein, Paul Ainsworth & Nathan Outlaw. Both the house and cottage date back to 1825, now renovated to a high standard, the buildings are very much a collaboration of old meets new. Many original features have been retained with owners Mark and Tonia Hixon ensuring a modern 21st century twist to the buildings. There is a huge emphasis on preserving the historic aspects, using local craftsmen and sourcing many local products and materials. The interior boasts a lavish design, focused on antiques such as the brass telescope and the original 1930s theatre light, juxtaposed with ornate outsized mirrors, intricate wall-coverings and a hand built oak staircase. Inspiration for the décor has been taken from traditional stately homes with a French country house influence, whilst period furniture has been sourced to compliment the age and stature of the property. Rich Farrow & Ball tones contrast against lux fabrics by Mulberry and GP & J Baker with carpets by Brinton’s Finepoint. Standout original features include flagstone flooring, exposed ceiling beams and stone walls combined with industrial antique lighting, faux fur drapes and velvet cushions that set the tone for kicking back in this unique Cornish retreat. Guests staying at the cottage are further indulged with breakfast Rick Stein’s Seafood Restaurant located just a couple of minutes walk away. Rick’s ethos is to use locally sourced produce with a focus on ‘wholesome cooking and great customer service’. The restaurant delivers an indulgent breakfast menu with a focus on fresh fish, simply cooked, ranging from smoked kippers, grilled sardines and kedgeree to the more classic full English breakfast and layered granola compote. 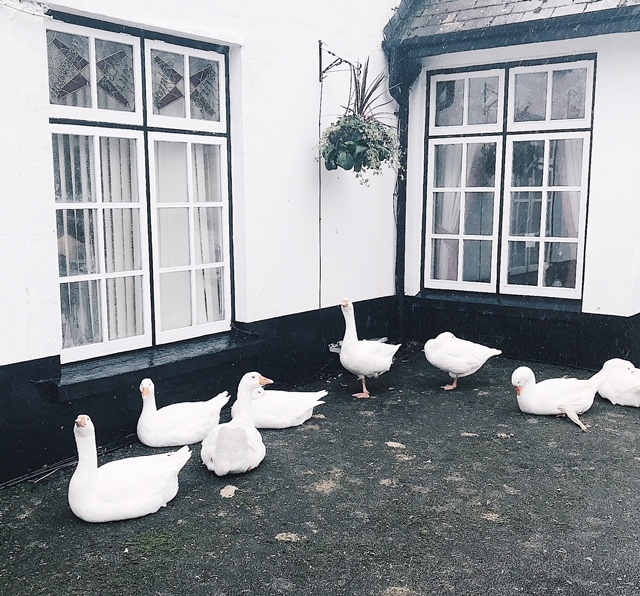 For the ultimate cosseted countryside escape, retreat to the heart of Dartmoor National Park; situated in the midst of jaw-dropping countryside, Two Bridges Hotel provides historic charm, old school decadence and the finest seasonal fare in a romantic setting. Enjoy a rural Devon hideaway with a hint of magic. What I love about Two Bridges is that it is so easily accessible yet has the feeling of being a million miles away; set in the heart of Dartmoor, with stunning scenery in every direction, the West Dart river right outside and the award-winning market town of Tavistock just a 20-minute drive away, providing a beautiful journey across expansive moorland. Previously a coaching inn during the 1700s, Two Bridges Hotel provides an oasis of friendly warmth amongst some of the most wild and dramatic landscape; stunning on a Summer’s day, with glorious countryside and equally magical arriving on a chilly winter’s evening as the mist descends, step into a welcoming lounge warmed by log fires and lit candles. Every room is individually designed to reflect the character of the building and the nature of the setting. The style and aesthetic is very much influenced by the hotel’s extensive history along with its stunning riverside location on the moor, with gorgeous views through every window. Luxurious bedrooms and traditional lounges are packed with antique furnishings and large ticking clocks along with comforting open fires. I adored the rich warmth combined with old-worldly decadence, though with the kind of informality that makes it perfectly acceptable to kick off your walking boots in the front porch after a hearty hike on the moor. A real highlight to my stay was staying in a room with such a great story behind it; the Vivien Leigh room is where the film star stayed at Two Bridges for a Hunt Ball in 1931 where she met her future husband Leigh Holman. The room offers an insight into the star’s career through the large portraits and cinema posters adoring the walls. I adored this aspect and felt something of the glitz and glamour of the era when taking a long bath and sipping tea and gin by the large window. Its all about a welcoming vibe, low lighting and a relaxed ambience, offering lots of spaces to settle with a book in front of a crackling fire, post dining. Beverages follow suit with craft ales from the Dartmoor Brewery, including the famous ‘Jail Ale’. The bar also stocks a great range of local gins, superb local organic soft drinks, along with Devon wines from Sharpham Vineyard.